Basic flat scratchers are economical - for best results, place a scratcher in every room of your house, so when your cat feels the urge to scratch, he'll have someplace to do it besides your furniture! Cat Claws Scratching Pads are made in the USA from renewable corrugated cardboard and are completely safe for your cat. They can be recycled and come packed with our 100% pure Cat Claws Naturally Nip Catnip - a feline favorite for over 30 years! 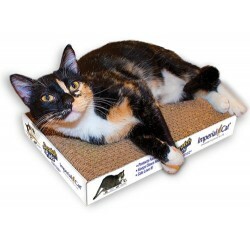 Imperial Cat Scratch 'n Pads are made in the USA from renewable corrugated cardboard and are completely safe for your cat. They can be recycled and come packed with Imperial Cat Certified Organic Catnip - certified pure and natural! 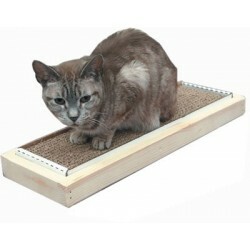 Flat Cat Scratchers There are 7 products. Our #1 Best Seller since 1986! Packed with our famous Cat Claws Naturally Nip Catnip, our original Scratching Pad is still our best value. The best corrugated cat scratcher money can buy! NEW low price, $5 each no matter the quantity. You can't fight a cat's natural instinct to keep his claws honed, so give him a healthy alternative. Includes a bag of our 100% Pure Natural Catnip. Measures approx. 14 1/2" L x 9 1/2" W x 2" H and Made in the USA! Refill for the Imperial Cat Scratch 'n Cuddle Bed. 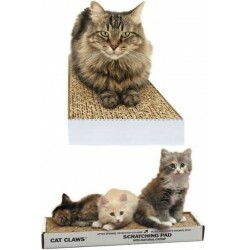 Twice as big as our Cat Claws Scratching Pad for BIG kitties! Same great material and our famous 100% Pure Natural Catnip. Safely made in the USA! SPECIAL Introductory Offer! Hurry, limited time only pricing. A super cozy bed and scratcher all in one! Stylish crate design to complement any home decor. 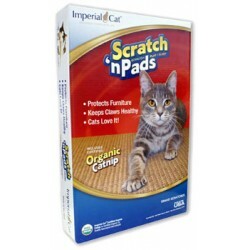 Cats have an innate need to scratch, and Imperial Cat meets that need with Scratch 'n Pads. A super cozy bed and scratcher all in one! Stylish crate design to complement any home decor. Measures approx. 14 1/2" L x 9 1/2" W x 2" H and Made in the USA!Refill for the Imperial Cat Scratch 'n Cuddle Bed.